It was supposed to be a rainy Saturday, with a chance of thunderstorms rolling through for most of the day. That wasn’t going to stop us from getting out to the woods however, and with a bit of rainfall it might even enhance the experience of hiking through the place we were headed to. 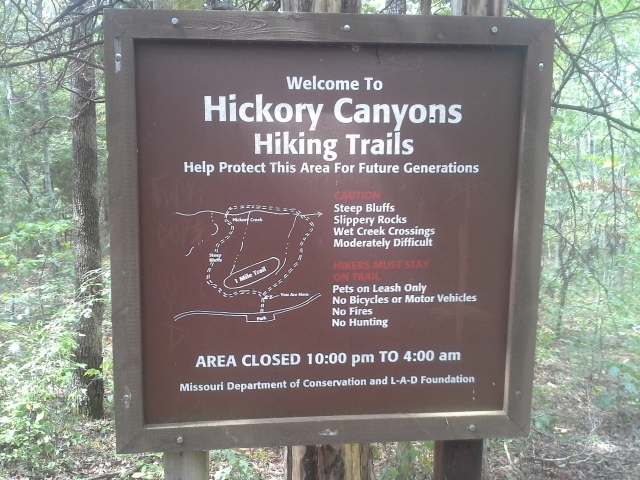 Our destination was Hickory Canyons Natural Area, and with all the steep, exposed rock faces of the ravines and canyons, including a wet weather waterfall in one spot and Hickory Creek in another, a thunderstorm might just be the right prescription to turn an already beautiful natural place into an even livelier and more memorable excursion. From the interchange of Interstates 270 and 55, in south St. Louis County, take 55 south for almost 50 miles to MO Highway 32. Make a right (west) on 32, toward Farmington, and take that for about 8 miles to Route C. Make a right on Route C, and at around 3 miles Sprott Road will be on your left. Turn onto Sprott Road and take that about a mile and a half to the parking lot on the left side of the road. There are two trails to hike here. The one on the parking lot side of the road is a 1/4 mile point to point. The one across the road is a one mile loop. Hike them both. The one mile trail that starts across the road splits shortly into the woods, and we took the trail to the right (counter-clockwise). 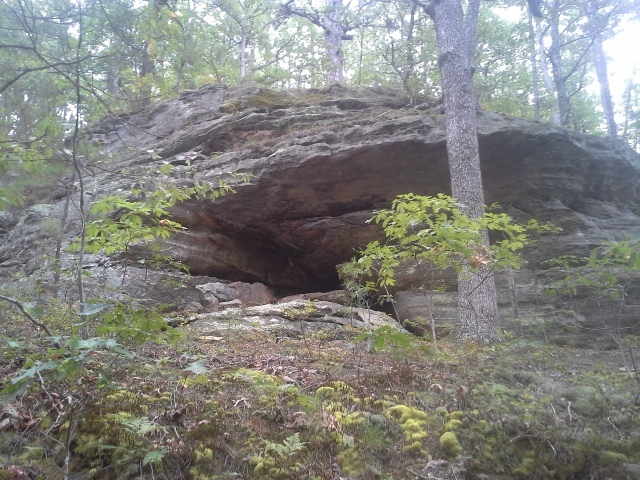 It heads directly through the upper woods into the canyons area, heading downward into the hollow along the right side of a ravine. At the bottom, the trail meets up with Hickory Creek, crossing over it a few times as the trail loops in a wide arc to the left. It eventually leaves the creek, and makes its way up to a plateau above one of the more scenic canyons in the area, and then through the woods and back out to the trailhead. The 1/4 mile trail goes down into a wider box canyon, and traverses along it until you eventually meet the end where a wet weather waterfall lies within the canyon walls. There is so much to see! Exposed rock faces, steep canyon walls, ferns, trees, mushrooms, water trickling all over the place and so many little nooks and crannies within the sandstone cliffs that you can’t help but appreciate the way that the natural forces shape the forest through the passing of the years. Because of the sandstone, and the rather sparse soil and exposed rocks along most of the trail, I can’t imagine that this path ever really gets muddy. Sure, the rocks might get a little slippery, but this would be a fine trail for hiking in most conditions. 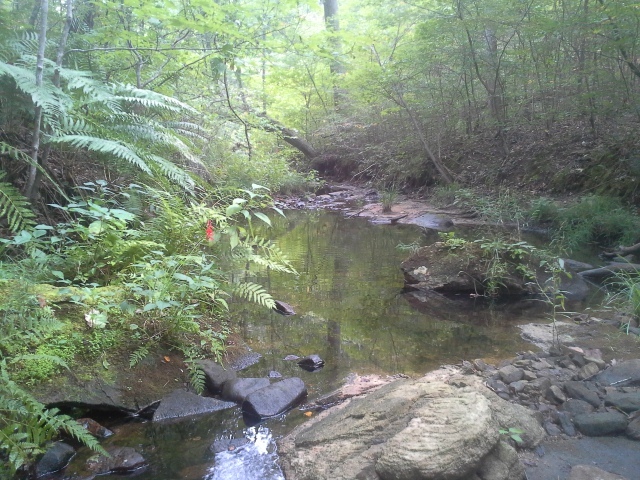 I love a water feature, and following Hickory Creek back through the hollow was a treat. 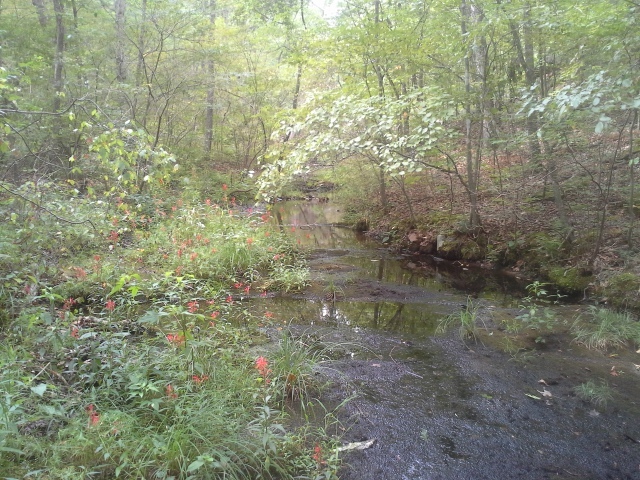 Filled with rather large minnows in some of the deeper pools, frogs jumping in for safety at every turn, and the occasional wildflowers along its bank, this was a very lively little waterway to hike next to for as long as we did. You just can’t beat a little creek hidden back in the woods, showing off the life and meditative beauty of a place, that undoubtedly through the course of history had quite a bit of involvement in the shaping of this canyon area. This is a short trail, but it has some steep spots and some rocky spots. Watch your step, and stop every chance you get to look around and take in all that there is to see. Maybe because there wasn’t a trash can in the parking lot, or that a small percentage of people make the rest of us look bad, there were enough bottles and cans and little pieces of litter along the trail and around the parking lot to fill a bag that is now deposited in my trash can at home. Be mindful and respectful of the ecosystem, and keep your garbage with you until you come across a proper place to dispose of it. 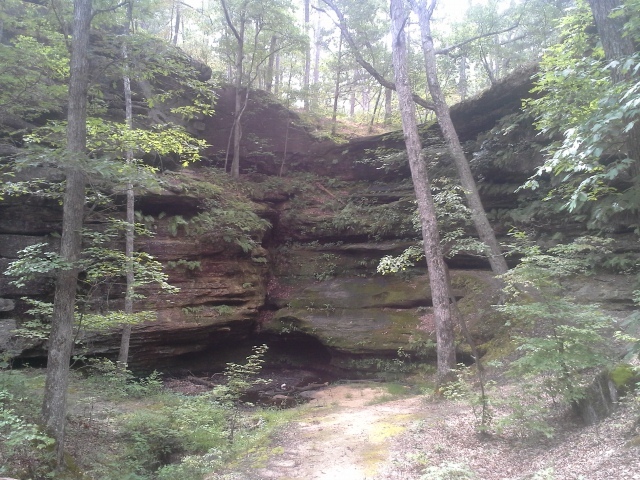 Like some of the places I have visited, I didn’t know about this gem of a Natural Area until just recently, but from the pictures I had seen and other people’s accounts of it, I knew I had to get down there to check it out. 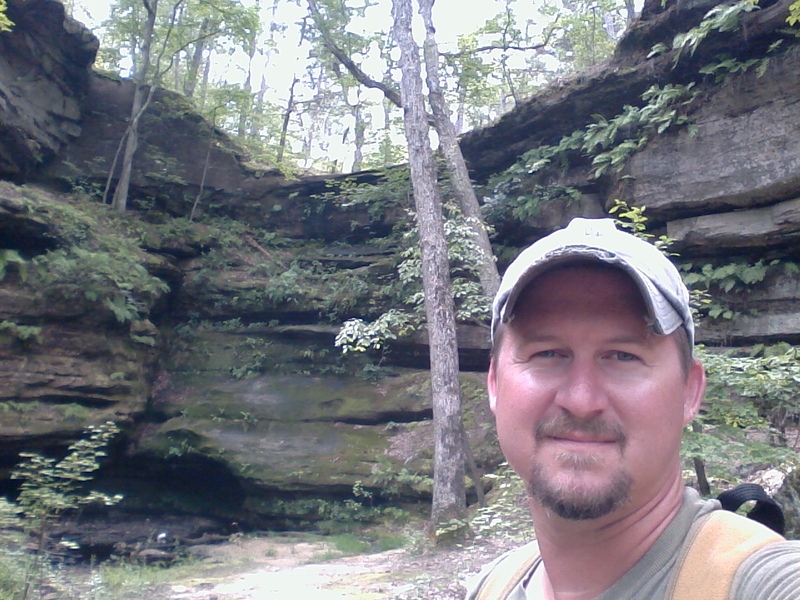 I was very impressed with the landscape and the life within it, and I can’t believe that after years of visiting nearby Hawn State Park and Pickle Springs Natural Area, that this was my first time here. 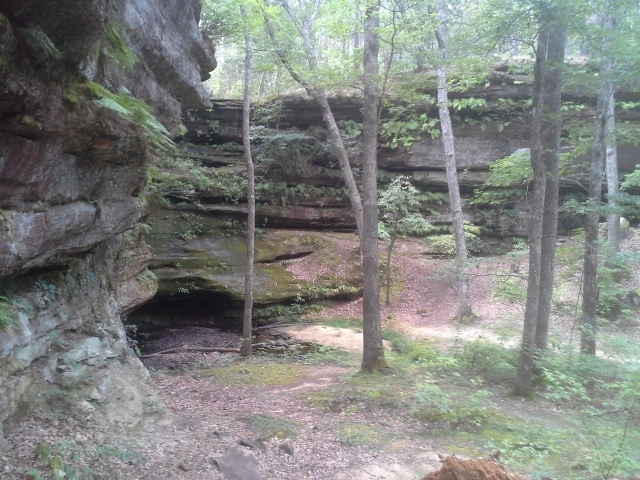 Make it a point next time you are around Farmington and Saint Genevieve, to bypass the more frequented places that people like to hike, and head over to the sandstone walls and forested hollows of Hickory Canyons Natural Area.